By Rebecca Nickols on November 22, 2012 Visit Rebecca's Website. I’m also thankful for my backyard flock of chickens! In addition to the delicious (and nutritious) eggs they provide, I’ve enjoyed hours of free entertainment. Each hen has her own unique personality: some will jump onto my lap, while others are convinced that I’m going to harm them in some hideous act of animal cruelty. These interesting and somewhat quirky behaviors blend together somehow and make the flock even more endearing. I’ve grown much more attached to these “farm animals” than I ever imagined I would when I first entered the world of chicken keeping. 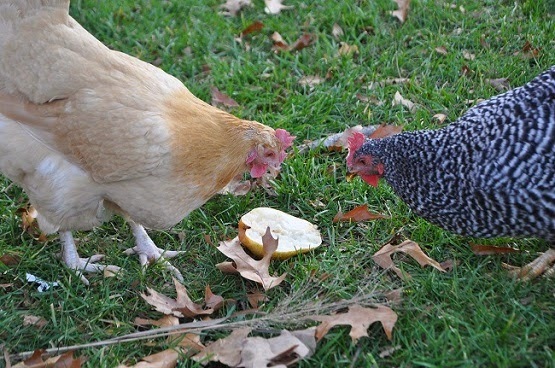 So on this day of poultry pardons, I’m joining the President in officially pardoning my flock… These lucky (free) free-ranging chickens will live out the rest of their lives without fear of an oven or a pot. Just to make things clear, however, I’m not opposed to raising chickens for meat–it’s a great step to live a more self-sufficient and sustainable lifestyle. If you raise your own food (meat), you know exactly how your meal was treated and what it was fed. I admire those who can process their own birds instead of buying commercial chicken at a grocery store or relying on others to package up the meat into acceptable–presentable packages. I just don’t have the heart to part with these chickens (aka-pets) that have become a part of our family! I might be thankful for my chickens, but they haven’t a clue how much they have to be thankful for! 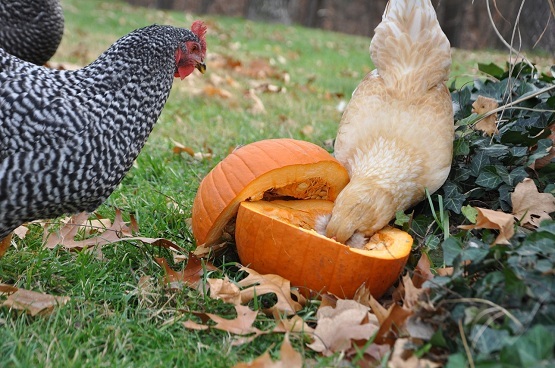 They’re content enjoying their Thanksgiving treats of the fall harvest–pears and pumpkins!